Why not email a message for the Visitors page? Here at Coda-UK our aim is to promote live music in mid Herts. Occasionally we visit local venues and photograph the live music event. We may even write a review of the gig. If you are involved with a local live music venue, or gig locally, you can publicize your gigs on this web site, free of charge. Click on this link . The only thing that we ask is that it involves the local area, specified above. The Hop Reunion at The Woodhall Community Centre, Mill Green Road, Welwyn Garden City. Click here for Hop Reunion 2007 photographs. We also have pages for Coda Recording and look back into the past with our 60's Local Music Scene page. Plus, we have pages (in alphabetical order) for our friends The Alligators, BlueNotes, Blackwater Junction, Bumps In The Night (60's group), Bumps In The Night, Caroline Cronin, Danny Bacon, Dave Barber, Del Woolsgrove, Clem Cattini, The Cortinas (Octopus), Delayed Reaction, Ellie Dee, Colin Frechter, Chris Gillies, Groove Shack, Haldens Social Club, Herbal Remedy, Hit 'n' Run, Kenny Hollywood, The Juniors, The Laurels, RNA Welwyn, Roger LaVern, Light Alloy, Loose Covers, Mixed Bag, Next In Line, Outcast, Pizazz, Recall, Tim Rice, Sam's Little Sister, Take Five, The Trekkas, The Troggs, The Ultimate, John Verity Band and Whang And The Cheviots. As well as photos from the Joseph And The Amazing Technicolor Dreamcoat 40th Anniversary Reunion, 1968 Joseph & The Technicolour Dreamcoat news articles and photos, The Hop 2008, The Hop Reunion 2007, Launch party for Tim Rice's CD, Basildon Festival 2005 - Dave Dee, Dozy, Mick & Tich and The Troggs. There is also a page for our radio friends at WMXJ Majic 102.7 Miami, Knebworth's Hertbeat FM, BBC Radio 2's Sounds Of The Sixties and Honesdale USA's Sunny 105. We also have added a Site Map to help you navigate around this site, and a Visitor's Messages page. Where you at Attimore Hall School, Welwyn Garden City in 1967? Click here to see a photograph of all the students and staff at the school in April 1967. Can you help in naming some of the students and staff in the photograph? Tornados legend Roger LaVern has died. Roger, photographed in WGC in 2007 with Maria, has died after a long battle with cancer we have just learned, today, Monday 17 Jun 13. We send our condolences to Maria and their family. Rest in peace Roger. Troggs legend Reg Presley has died! 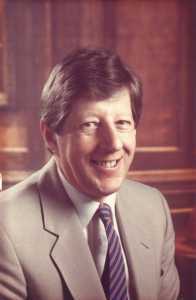 After suffering several small strokes and battling cancer, Reg Presley, died quietly at his home in Andover on 4th February 2013. We send Reg's family our sincere condolences. We will miss over friend's stories and humour. Rest in peace Reg. To contact coda, click on this link to email them to Coda. Recall Rhythm guitarist, COLIN FAY sadly passed away Tuesday morning (March 13th) after a long and brave fight against cancer. He was a lovely man, a true gentleman, and a gifted guitarist. I will miss him greatly, advises Chris Gillies. 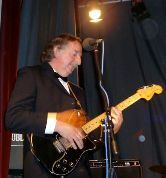 Colin is pictured at the 2007 Hop Reunion, resplendent in Black Tuxedo, playing his beloved black Fender Telecaster. 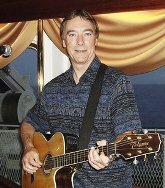 Guitarist, vocalist and friend DON FOWLER has died. His daughter Carly advises that Don, aged 63, died on the 20th Feb 2011 from a rare form of cancer. Rest in peace Don, you are greatly missed. Click here for photos of Don. For over 65 years Marie Lipstadt-Pinhas, from Brussels, Belgium has been trying find the US soldier who helped liberate her from Turkheim (Dachau) concentration camp on 27th April 1945. Although Marie didn't know the Soldier's name, only that he was from the 7th U.S. Army, 10th Armored Division, Coda took up the search on 5th June 2004. On Sunday 6th June 2010 an email arrived from Lorrie and Phil Green in Sparta, Wisconsin. Marie's 65 year search was over, we had found the US soldier. His name is Harry Hendersin. Click here for the full moving story. Marie's story was covered by Channel 8 News, Wisconsin!! A Soldier and the Dress Part 2. Joseph And The Amazing Technicolor Dreamcoat 40th Anniversary Reunion. In memory of former EMI / Abbey Road producer Bob Barratt who sadly passed away on Monday 26Jan04. He is greatly missed. © Copyright Coda 2014. All rights reserved worldwide.